Tourist boat trips sail through Icebergs from the Jakobshavn glacier or Sermeq Kujalleq drains 7% of the Greenland ice sheet and is the largest glacier outside of Antarctica. It calves enough ice in one day to supply New York with water for one year. 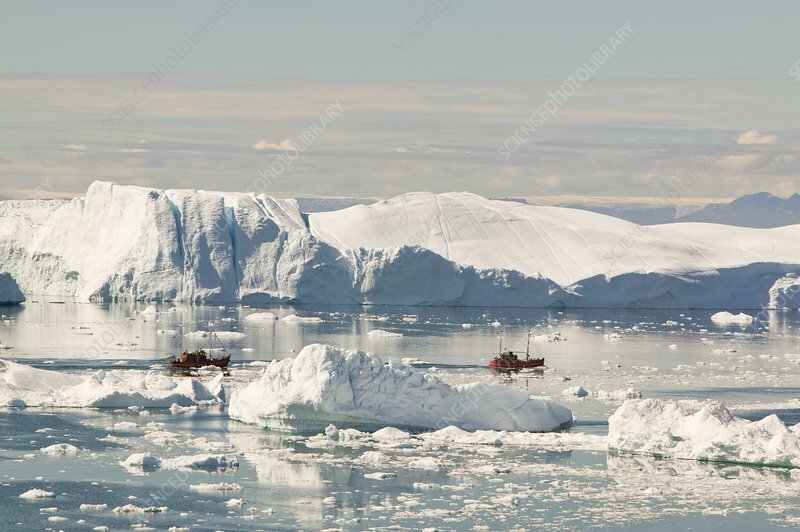 It is one of the fastest moving glaciers in the world at up to 40 metres per day (19 metres per day before 2002) and has also receded rapidly (40 km since 1850) due to human induced climate change as temperatures have risen in Greenland by 9 degrees Fahrenheit in the last 60 years. An underwater moraine at the mouth of the fjord grounds the largest icebergs causing a backlog of ice completely blocking the entire length of the fjord with ice.